Still working full time at the age of 100 in a job that is both fulfilling and of immense importance to others is not an image of later life we are used to. There’s a tendency to focus on the very real challenges to society presented by ever growing numbers of seniors now living well into later life. By 2050, people over 60 will account for one quarter of the urban population. Additional healthcare, different housing needs, extra social care, loneliness, access to transportation – there are so many pressing issues that being older is now primarily seen as a burden and a problem for the remaining working adults. That’s not how Dadi Janki sees it. Dadi (which means elder sister in Hindi) turns 100 in January 2016. Still working full time, she thinks very much in terms of what she can continue to give to society. Dadi began her new job at the age of 92, becoming the Spiritual Head of an international spiritual education organisation, a job which takes her around the world. This year alone she has so far clocked up 49,418 business air miles. In a world of challenges and great change, the wisdom that Dadi aged 100 can offer seems to be much in demand. Her daily routine starts at 4.00 am with a schedule packed full of meetings with both students of the organisation (Brahma Kumaris World Spiritual University) as well as leaders from business, government and all walks of life. This week (October 1st) the UN is holding its 25th International Day of Older Persons and this year the emphasis is on age inclusiveness in the urban environment. Dadi Janki however, as anyone who knows her has come to expect, doesn’t restrict herself to just one urban setting. In the last few months alone she has spent time in London (her home for most of the past 40 years) New York, Kuwait, Morocco, Malaysia, Singapore and numerous cities throughout her native India. All of this is quite impressive. So how does she keep so youthful and active with a schedule that many people half her age would find somewhat daunting…? 1. Sense of Purpose. Dadi has a very clear vision for the future of humanity, which she feels she is working towards and will continue to do so. Retirement is not a word in her vocabulary. When you have passion for what you are doing, why would you want to stop? This passion and sense of purpose gives her energy, drive and commitment. 2. Inner Connection. Dadi feels a strong connection to her own inner being and to a greater power beyond herself. This gives her a rich inner life and is the source of her own energy. 3. Spiritual Discipline. Dadi’s life has been committed to following a spiritual path which nourishes and sustains her. This gives her life structure and discipline and keeps her focused. She always experiences a state of deep inner peace with a quiet and stable mind. This power of silence means she can stay calm, no matter what is going on around her. 4. Control Over Thoughts. 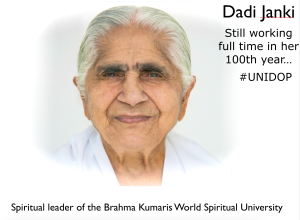 Dadi has a well-developed control over her mind (through the daily practice of meditation). This allows her to focus only on positive thoughts which bring benefit to herself and others. Despite her many bouts of ill health, she chooses not to pay attention to any aches and pains. “Thinking about my pain only adds to it” is her answer to doctors’ questions about what she is feeling. 5. Selfless Service. Thinking of others is a secret key to a happy life. Dadi’s life has been one of altruistic service, thinking of the needs of others in balance with her own needs. This keeps the energy flowing out to others so it can flow back in return. She is therefore continually supported by the good wishes of those she has first supported herself. 6. Living with Others. Throughout her life, Dadi has lived in community with others. There are always people around her, of different backgrounds and walks of life and importantly across the different generations. This keeps her in touch with what is going on and with the energy of youth. 7. Early Rising. Dadi has always woken early each day (4.00 am). Morning meditation gives her time with herself and her connection with the Divine. She always keeps this time as her own special time. This gives her the power and energy to get through the day without experiencing any stress, even though she has a very demanding workload. 8. Simple Life. In contrast to the aims of many people today to accumulate and acquire, Dadi has very few possessions. She is therefore able to travel light and keep her world clutter-free, clean and simple. This keeps her from feeling heavy and burdened. 9. Healthy Living. Dadi’s food has always been vegetarian. In addition, she places great value on the nourishment of food that has been cooked with love and good wishes. 10. Laughter is part of life. Despite her heavy work schedule, Dadi always finds time to laugh. Her teachings are deep and thoughtful yet she is able to bring a lightness through her humour.